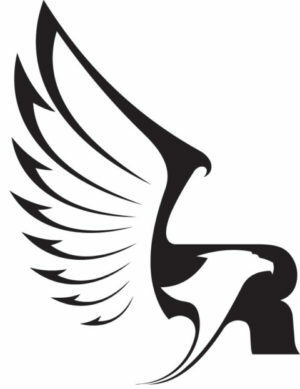 375 RAPTOR brass is available for purchase or forming yourself. A Power Case Trimmer set up to trim .375 caliber. 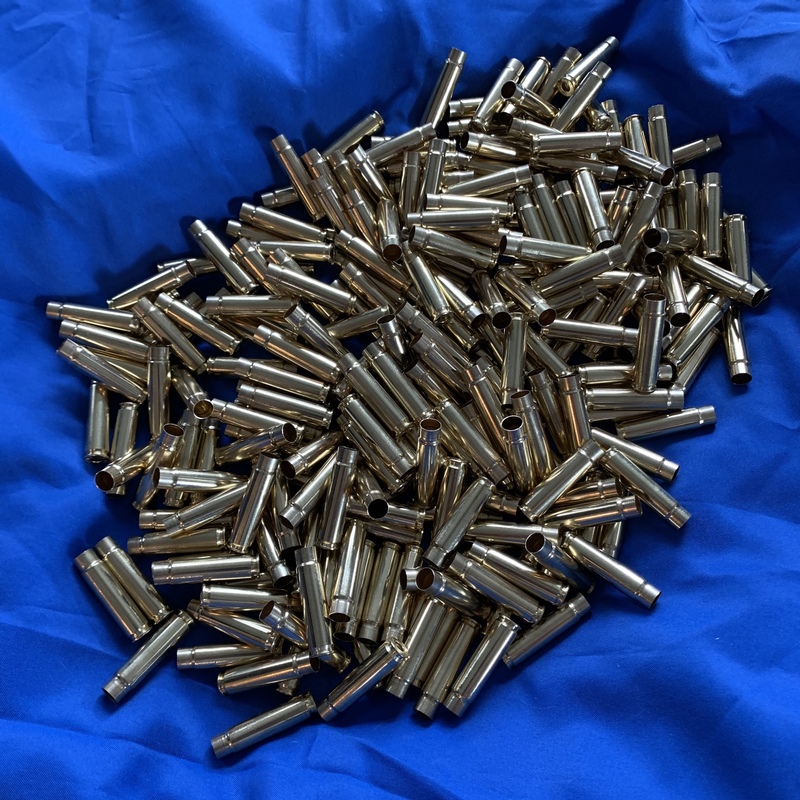 First, lubricate both the resizing die expander and the 308 Winchester brass you are starting with, in particular, you want to make sure the the inside of the neck is lubricated. My personal choice is Imperial Sizing Wax. Second, place the case in your standard reloading press that has been fitted with a 308 Winchester shell holder and the 375 RAPTOR Full Length Resizing Die. If you don’t want to expand the neck in one step, you can first use a .338 Caliber expander mandrel and finish the expansion and set the new shoulder angle with the 375 RAPTOR Full Length Resizing Die. In doing this operation using new Winchester commercial brass, the brass loss rate was 1%. In making 300 finished cased, 3 cases were scrapped with 1 case neck splitting and 2 cases necks collapsing. Finally, once expanded and the shoulder is set, all you need to do is trim the neck using a normal case trimmer to give you an overall case length of 1.865 inches. Depending on your parent 308 brass, this will require trimming .115″ to .125″. As an alternative process, it is possible to trim the parent 308 Winchester / 7.62 NATO brass using a common trimmer set-up for 308 Winchester. Following trimming, you then would resize using the 375 RAPTOR full length die and clean up the case mouth. This alternative process requires some experimenting to get the proper trim length based on the parent brass you choose. 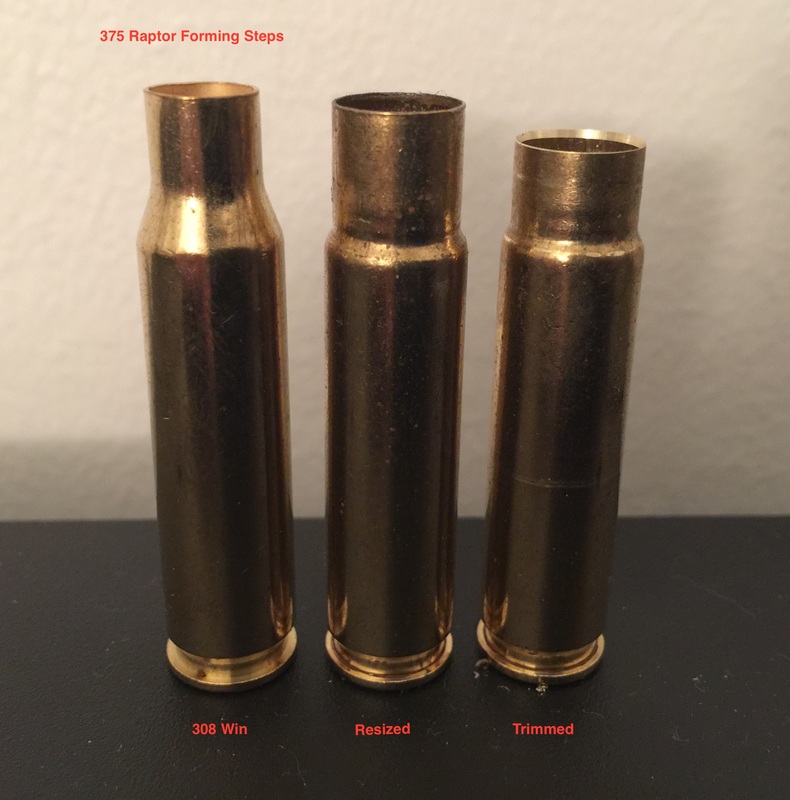 Once you have completed initial forming and trimming of the 375 RAPTOR, you are now ready to wipe off the lubricant, prime your brass and proceed with loading ammo. Note: If you plan to anneal the case necks, it is recommended that you do it after the first firing, before resizing. The 375 RAPTOR is designed to shoot bullets ranging from 175 grains up to 350 grains to meet a wide range of applications from sporting to professional in both supersonic and subsonic use. Note: All bullets shown are loaded at or under the maximum magazine length of 2.800 inches taking full advantage of the operating capabilities of the AR-10, LR308, SR-25 and G2 platform. 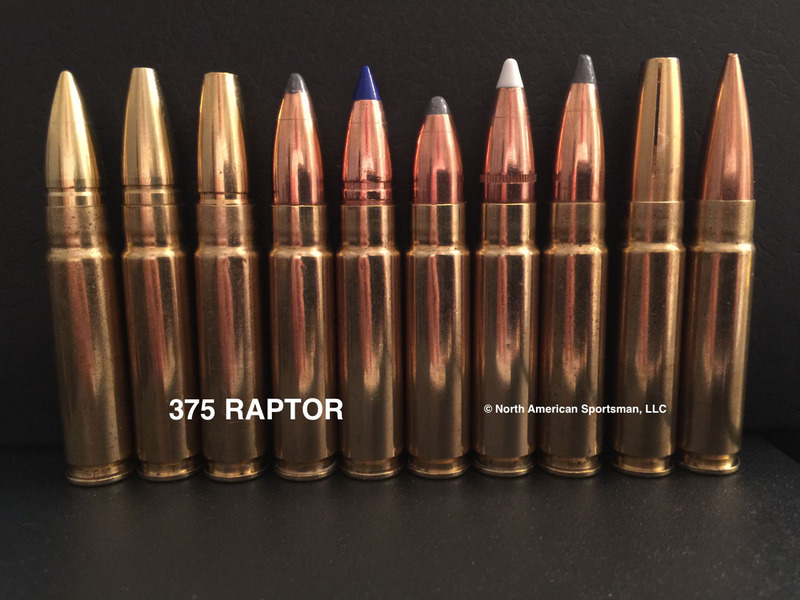 The .375 RAPTOR performs with a wide range of powders from Alliant, Hodgdon, IMR, Accurate, Western and Vihtavouri.